I love looking in other peoples’ trolleys at the supermarket. I find so many new foods that I just don’t notice when I walk passed them on the shelves. It’s human nature to see what everyone is doing too, right? I often get asked what I buy so I thought I would get a photo of my shopping before I put it away. It got me thinking that there isn’t really an ideal weekly shop, so I have asked a few special guests to contribute to this as a series! This is the first in 5 part series giving you glimpse into someone else’s weekly food shop. I’ve asked 4 other Aussie mums (some nutritionist professionals, some not) to share their weekly shop too. All from different sized families, some with food allergies, some without; to show how different healthy can be. Real life healthy eating for normal families. Family food shopping isn’t all about which food is healthier. This series will be interesting to see how other priorities like taste preferences, environmental issues and packaging impact a family’s shopping in different ways too. One message that I am so passionate about sharing is that there is no one way to be healthy. Just because eating a certain way makes someone else feel great, doesn’t mean it’s right for you. Just as if it’s in my trolley, doesn’t mean it needs to be in yours. 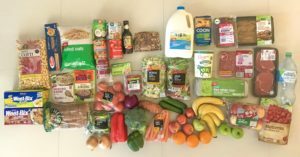 It is interesting to see what a real life nutritionist (and working mum) buys in an an ‘average’ week to keep the family fed. I hope you find this real-life series useful, reassuring and inspiring with new food ideas. Let’s get started! This was my food shop on December 29, 2017. 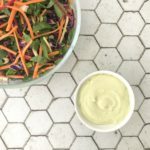 Each week as part of this series, I’ll be asking a guest blogger the same questions to get a little more insight into their healthy shopping. If you want to know more about a product you see or why it’s a good choice, ask in the comments. I have a very practical approach to healthy eating. I don’t mind supermarket brands and I always check the price per kg of packaged and loose fresh fruit and veg to get the best deal. When we’re busy I won’t hesitate buying some pre-marinated meat or a bagged salad so we have quick and easy options that are a lot better than takeaway. I usually shop at Coles, Aldi and Woolworths. 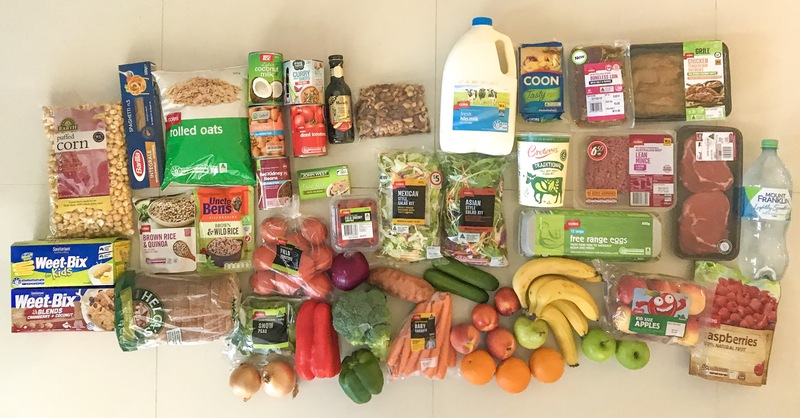 Aldi and Coles for price and depending on who has the products that I like. I like to shop between them to chose the freshest looking fruit and vegetables. This shop was Coles and Woolies. Myself, my husband and our 2 year old daughter. This should last the week with a top up vegetable shop in a few days. I’m still working out the right quantities to buy to last the week, but my toddlers appetite fluctuates so much. I also don’t mind needing a top up shop mid-week as it means I can be more fussy with my bread and vegetables (if they don’t look super fresh, I’ll wait until my next shop). That’s what’s in my trolley! 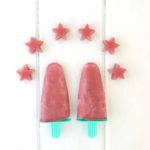 Make sure you follow me on facebook and Instagram so you don’t miss next week’s guest post for a sneak peak at their weekly shop (Hint: It’s a Dietitian and mum to 3).